Apulia is a region in Soothren Italy borderin the Adriatic Sea in the east, the Ionian Sea tae the sootheast, an the Strait o Otranto an Gulf o Taranto in the sooth. 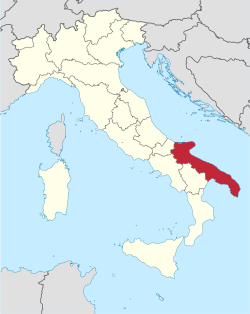 Its maist soothren portion, kent as Salento peninsulae, forms a heich heel on the "buit" o Italy. The region comprises 19,345 square kilometres (7,469 sq mi), an its population is aboot 4.1 million. It is bordered bi the ither Italian regions o Molise tae the north, Campanie tae the wast, an Basilicata tae the soothwast. It neighbours Greece an Albanie, athort the Ionian an Adriatic Seas, respectively. The region extends as far north as Monte Gargano, an wis the scene o the last stages in the Seicont Punic War. ↑ From Greek Ἀπουλία; in Italian: Puglia pronounced [ˈpuʎʎa] (Demonym: Pugliese).